In a paper "Indication of anomalous heat energy production in a reactor device containing hydrogen loaded nickel powder" Levi et al describe a series of "black box" tests on the Rossi "Hotcat". Unlike previous eCat models which heated water, producing steam, the "Hot Cat" was evaluated on its own, producing heat in the form of radiation and convection. November 2012. 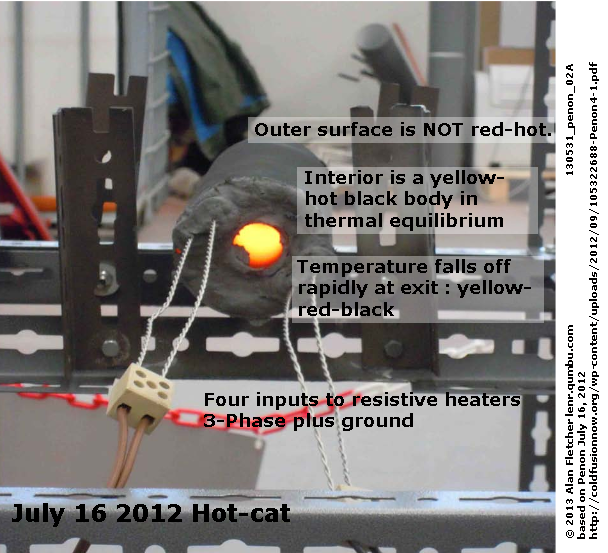 A test was started with a new "Hot Cat (HT)", but the eCat "ran away" -- reaching an external temperature of 850C, and glowing red hot. "The performance of this device was such that the reactor was destroyed, melting the internal steel cylinder and the surrounding ceramic layers. " They did not report that they checked the DC component of the input power, but subsequent statements by one of the authors says that they did. The investigators were not allowed to see the "magic powder" (they were allowed to see its container), or to look inside the controlbox, or to examine the waveforms on the wires between Rossi's controller and the eCat. None of these affect the calorimetric results. Apart from these restrictions the experimenters were allowed to bring any equipment they liked. In addition to analyzing the energy performance, the authors commented on the unusual shape of the waveform of temperature with time, when a "square-wave" stimulus is applied,: the expected response is an exponential rise and fall. The actual curve looks more like a distorted sine wave. They suggested that this "warrants further in-depth enquiry" : here it is. 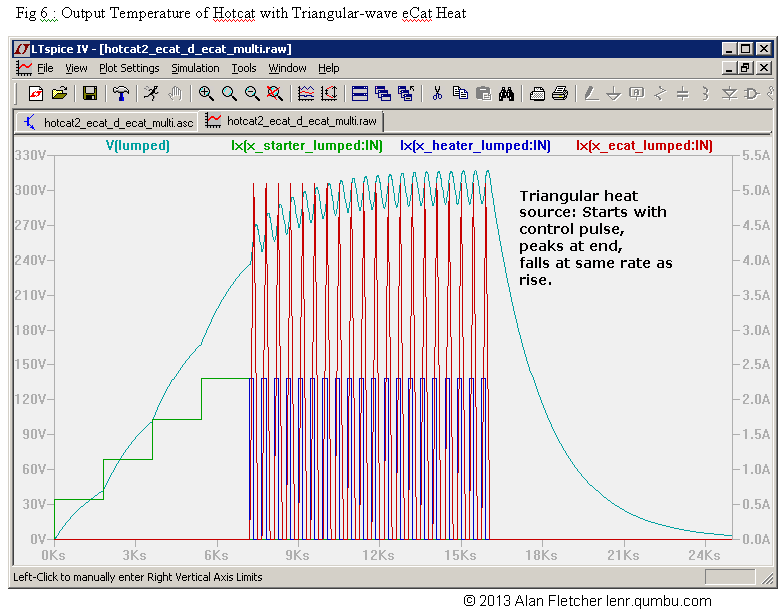 I am using the Spice transient analysis program to perform thermal modelling. (There are direct relationships between electrical and thermal values -- for instance Temperature corresponds to Voltage). I started with a simple lumped model, where the Capacitor C represents the thermal mass of the system, and the resistors represent the radiative and convective heat loss from it. The square wave produces the anticipated exponential rise and fall, but the triangular wave looks more like the actual response, so I made a more detailed lumped model (schematic not shown in this summary) and applied various waveforms to it. The input from Rossi's controller is composed of two stages .. a STEP function to start it, and then a 35/65 PULSE to sustain it. We can then apply various waveforms to the center of the hotcat, presuming that is where the anomalous heat is generated. 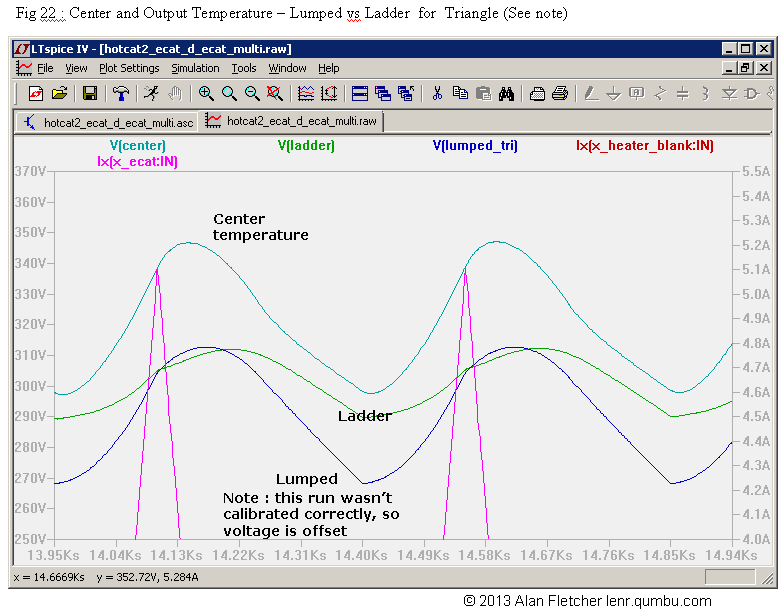 The Triangular wave gives the best results at the output ... but when I moved to a Ladder model I preferred the Sawtooth. The single lumped capacitor has been replaced by separate capacitors for the outer cylinder, the ceramic center, the inner cylinder, and the center. Between them are resistors representing the Thermal resistance (R-value) of the material. We are particularly interested in the temperature of the outer cylinder, and in the center which contains the "magic powder". 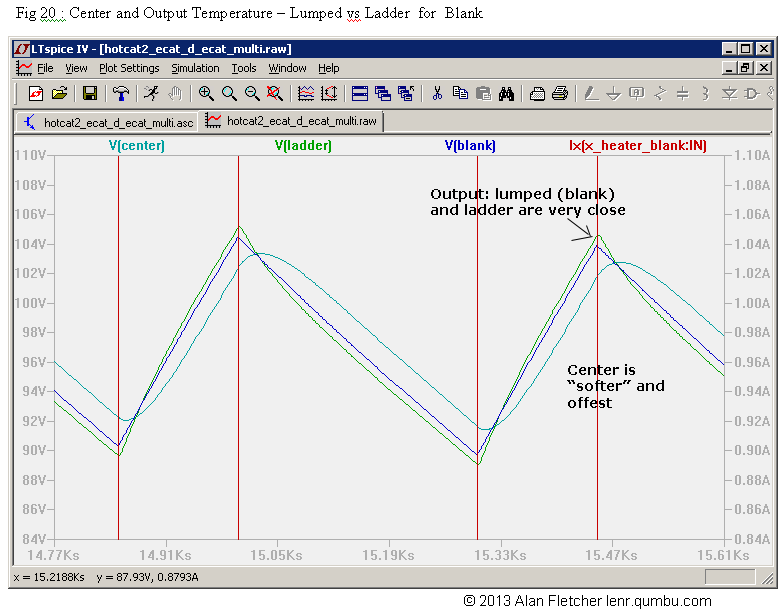 This is encouraging, because the output (LADDER) is a good match to the observed temperature, and the temperature at the CENTER bears at least a passing reemblance to the pulse which produced it, supporting the idea of a linear model. 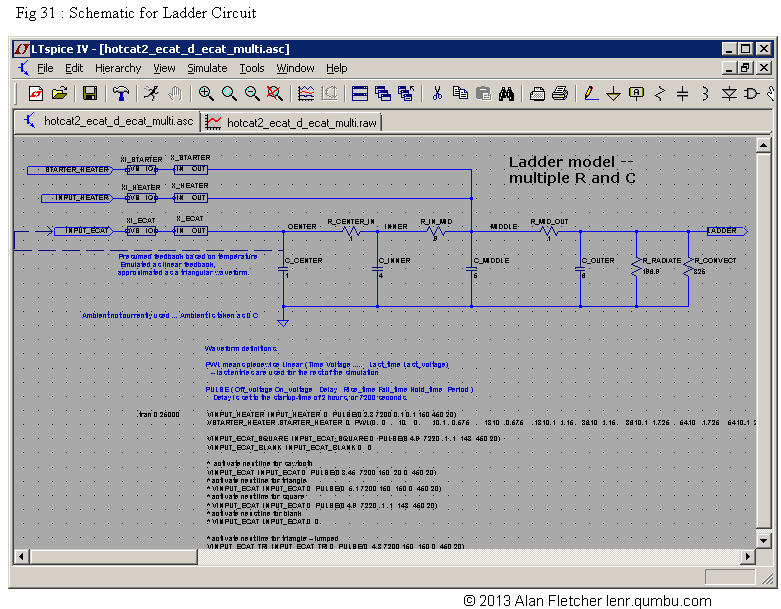 The ladder model is expected to be a little "softer" than the lumped model. 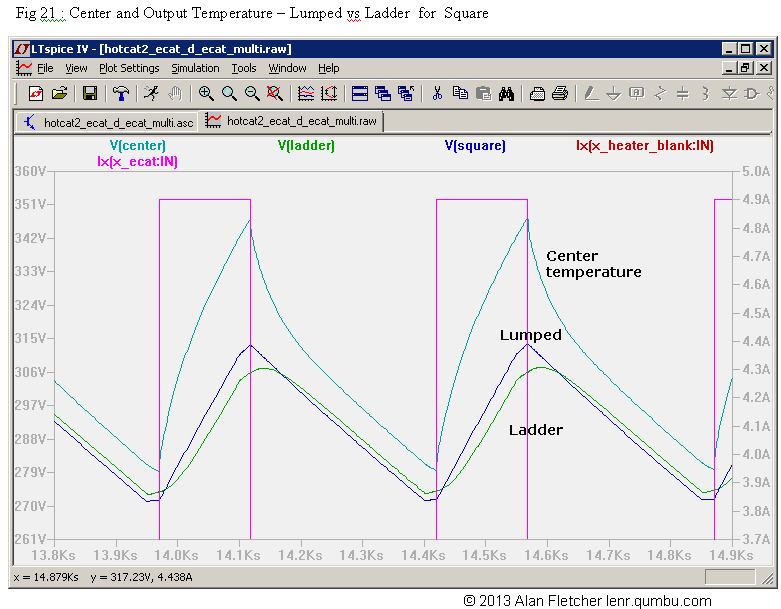 The similarity of the LUMPED and LADDER models indicates that the Spice model is well-controlled and stable. 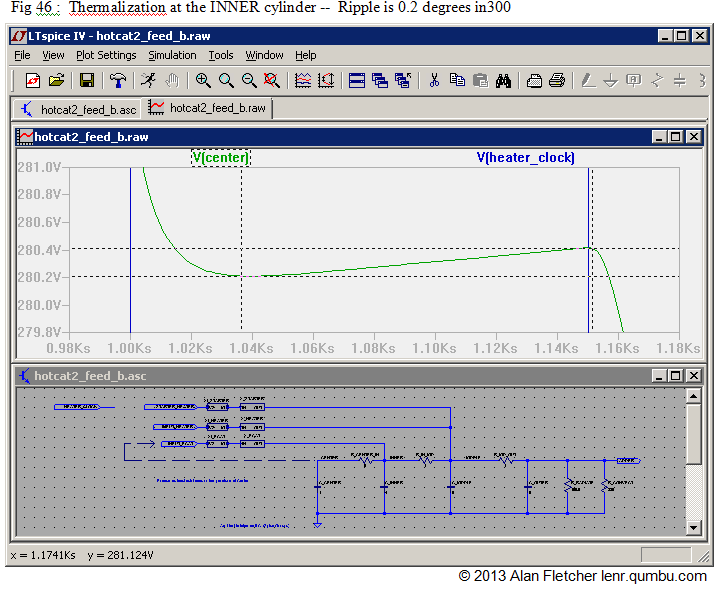 (Hidden below that 13 degree ripple is a 100 degree "DC" component.). WARNING : the curve looks as if it bottoms out to a minimum ... but this is a 0.2 degree ripple in a 300 degree signal in a simulation which is AT BEST 20% accurate. This also affects the decision at the end of the cycle : the heater triangle peaks, and reverses direction. But at the center this will show up only as a small change of slope. My guess at a rule : START a sawtooth when the temperature changes from FALLING to FLAT. STOP the sawtooth when the temperature changes from FLAT to FALLING. I need to rerun this with the FIRST half of the pulse, so we are set up for the decision. This is a "clear" signal. It is not at all clear from the rising waveform whether to stop, or to rise indefinitely. My guess at a new rule : START a sawtooth when the downward temperature changes from to STEEP to SHALLOW. STOP the sawtooth when the temperature changes from FLAT to FALLING. STOP .... when???? I can see how to do that with an arbitrary algorithm, but I don't see how to relate that to a physical process. Next steps : Calibrate this model using actual values of specific heat and thermal resistance for the various components. This should improve the accuracy from 20% to 10%. I expect that the exact shape of the "ripple" will be different, but that we will still see a levelling of the control signal, and not a rise. 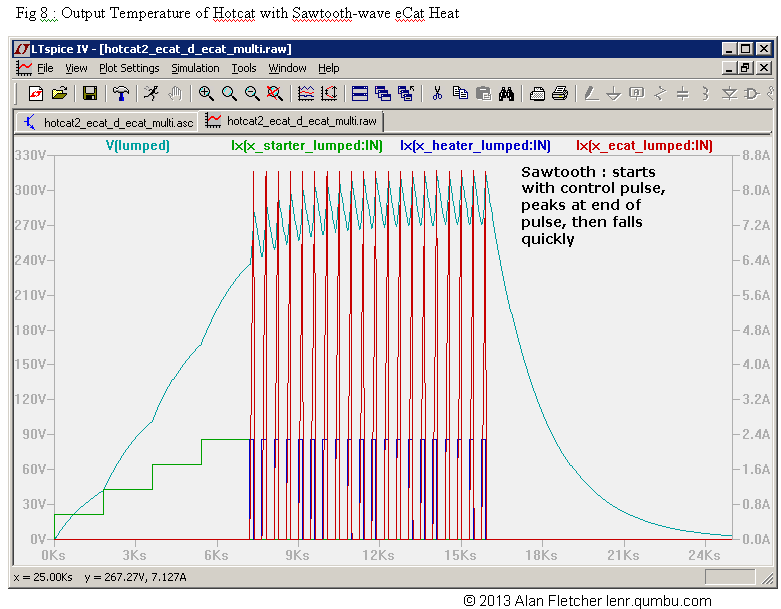 Conclusion (so far) : The Sawtooth heat production looks like a good description of the heat production. The mechanism which produces this sawtooth is not obvious. Missing : The authors most likely have a lot of information about the applied power and temperatures when the hotcat was being started (by increasing the input in a series of steps), and in the cool-down stage -- both in the live and dummy tests. These could be used to calibrate the thermal model. In addition, they should publish pictures of the middle ceramic section and the way the heater wires are arranged (or confirm that it is similar to the Penon version). This information is obtained from the above paper, plus an internal report by Penon of an internal test, using the same methodology, but with a different topology (the eCat was in the form of a tube, with a gap in the center, rather than the current cylinder). The most important element of the E-Cat HT was lodged inside the structure. It consisted of an AISI 310 steel cylinder, 3 mm thick and 33 mm in diameter, housing the powder charges. Two AISI 316 steel cone-shaped caps were hot-hammered in the cylinder, sealing it hermetically. Cap adherence was obtained by exploiting the higher thermal expansion coefficient of AISI 316 with respect to AISI 310 steel. Finally, the outermost shell was coated by a special aeronautical-industry grade black paint capable of withstanding temperatures up to 1200° C.
Power cables to the eCat. There are no obvious return cables providing feedback to the controller. 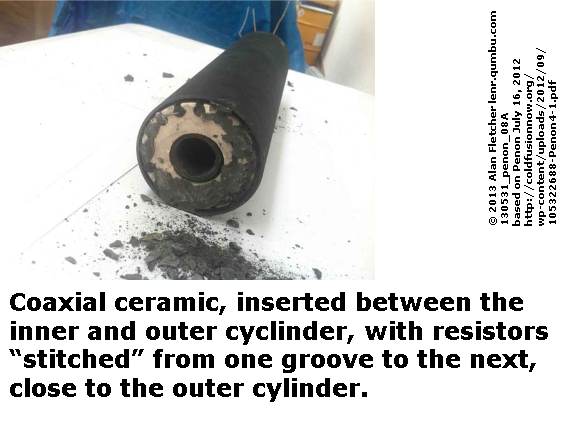 A ceramic corundum cylindrical insert (shown only in Penon -- where it is actually made of two sections), which in the new hotcat probably fits tightly in the gap between the inner and outer cylinders. 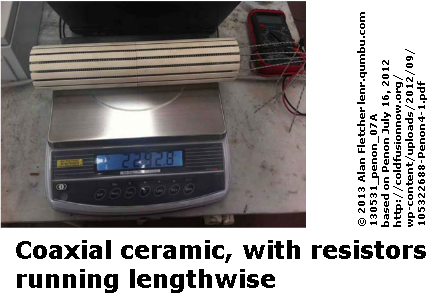 A set of resistive heater wires in in troughs in the ceramic the length of the cylinder, and evenly spaced round the cyclinder. In the Penon version they are on the outside of the cylinder. Their position in the new version isn't specified -- they are assumed to be near the outer edge. This is a missed opportunity for the radiative calorimetry. You are looking into the orifice of a classical black body, where the inside is in radiative thermal equilbrium. They should have used the infrared camera from this angle. Despite Levi's description of the March HT2 resistors as "helical", he is probably describing this configuration. With the resistor wires running the length of the eCat, close to the outside ceramic cylinder, and doubling back on themselves there is at most a small chance of their generating electric or magnetic fields which could communicate in any way within the outer cylinder, and a vanishingly small chance that they could penetrate to the inner steel cylinder. We therefore have to conclude that ANY communication from the controller to the inner reactor chamber can ONLY be accomplished through heat transfer. (Some have suggested the possibility of creating thermal D-waves, but that is beyond the scope of this analysis). This hotcat "ran away". The pattern of brighter and duller bands indicates that a similar ceramic insert is used, with the "cog" pattern holding the resistors, at the outside edge of the hotcat. NOT a shadow! Penon's plot clearly shows that power was supplied in a series of steps, resulting in an exponential RC rise of temperature for each step. 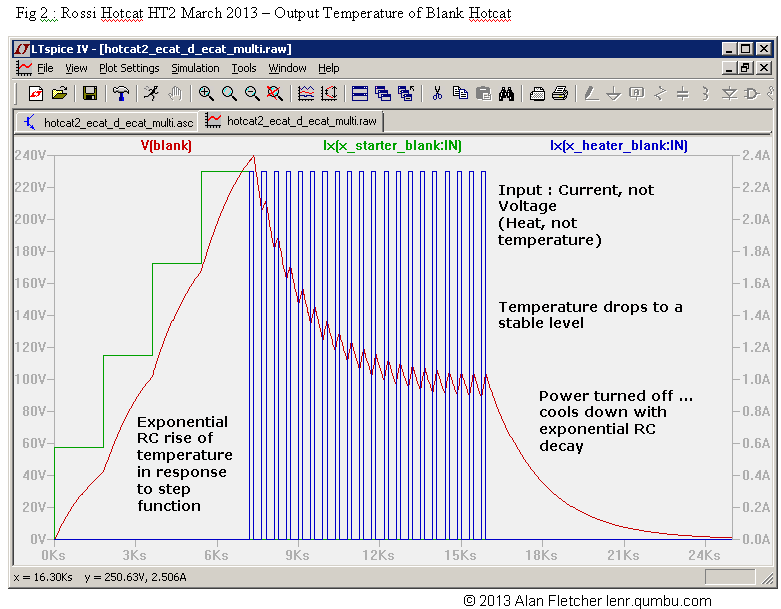 Then the hotcat was turned off, with an exponential fall as it cooled. The December Hotcat was already running when they started the test, and they do not record the cooldown phase. Since it was running at constant power, there is little relevant information in this plot. For the March test the hotcat was heated up in a series of steps, and then switched to automatic control, where "full power" was applied with a 35/65 duty cycle with a period of about 450 seconds. They also performed a test on a "blank" or "dummy" ecat, with an empty reactor. Again, it was heated in a series of steps, measurements were taken after it was stable, and then it was turned off. We only have the stable values, but they do provide important calibration information. Unfortunately the Levi team did not include a thermal plot at these critical times, or for the cooldown phase. 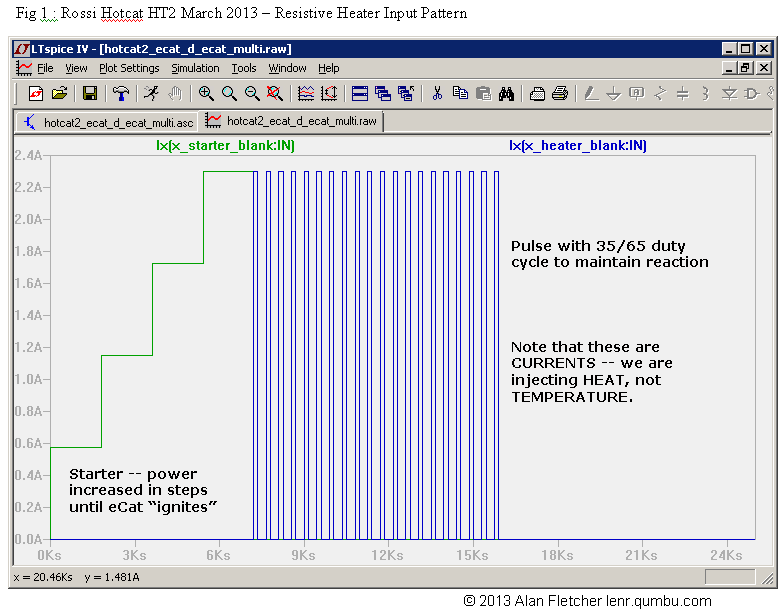 They do, however, include a representative plot of temperature for a few cycles of the resistor heater. The question is : can we derive any useful information about the eCat from this little diagram? 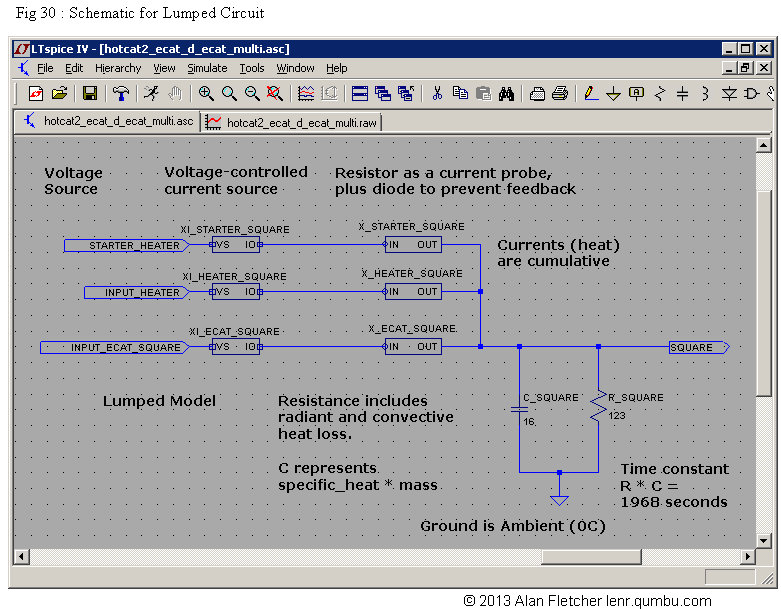 Spice is a program for electrical circuit simulation ... calculating the voltages and currents in circuits composed of resistors, capacitors and many kinds of transistors. Spice will be used to model the thermal behaviour of the HotCat. 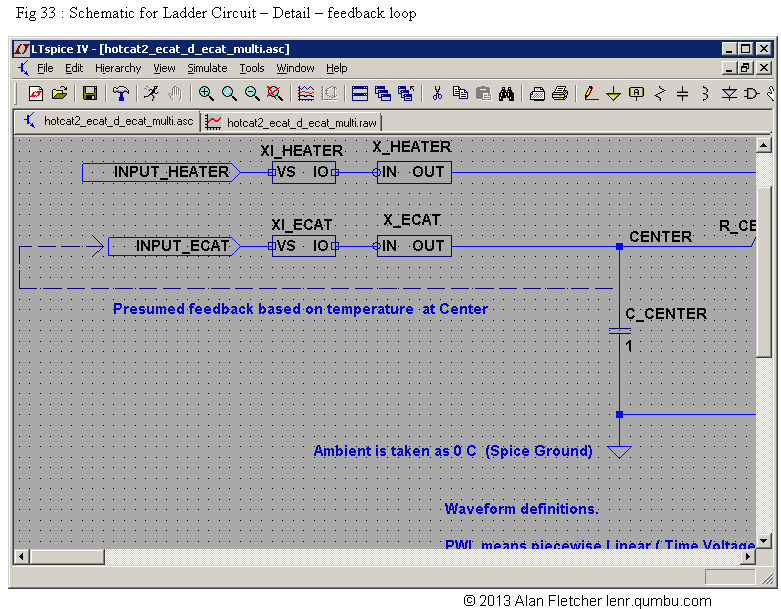 I am using LT Spice , which includes a schematic editor and a waveform viewer. Note : Robert Ellefson (on vortex) pointed me to an article on potential problems with Spice thermal anaylis, and their solution Stout & Billings. I believe I have taken all of these into account, and have a stable and reasonably accurate analysis. Needed : the thermal resistance and specific heat of steel (easy to find), and the ceramic insert. 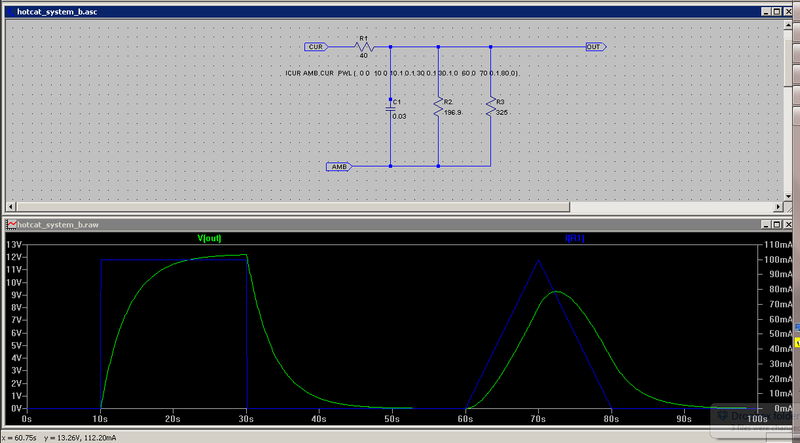 This is a simple model, with a current source driving an RC circuit. 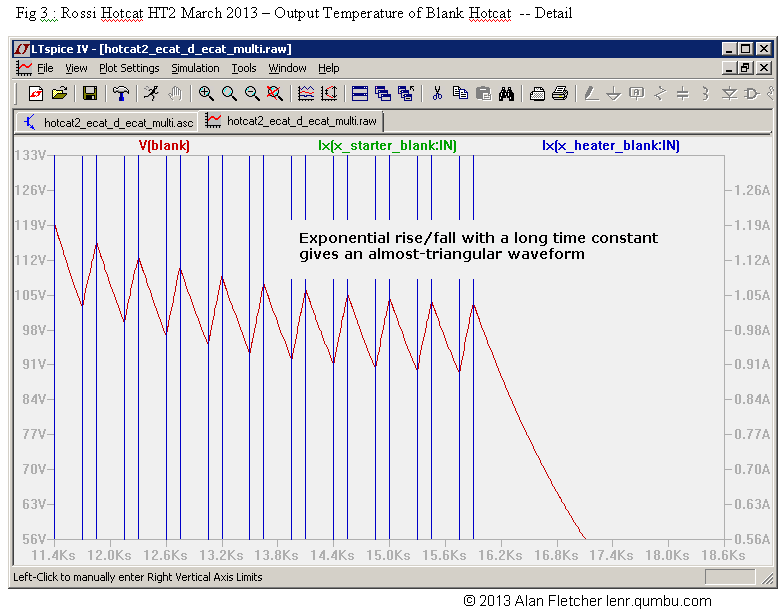 With a step input function (blue) we get the expected exponential rise and fall. With the triangular waveform the initial response starts off coincident with the rising edge of the pulse, where it is concave (like a sin wave), rather than convex like an exponential. 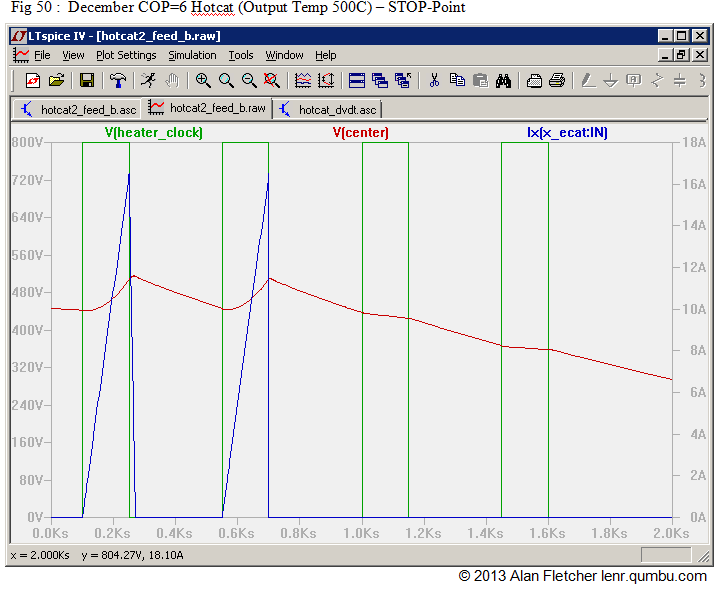 And then, when it falls, the peak of the response is shifted to the right of the stimulus. 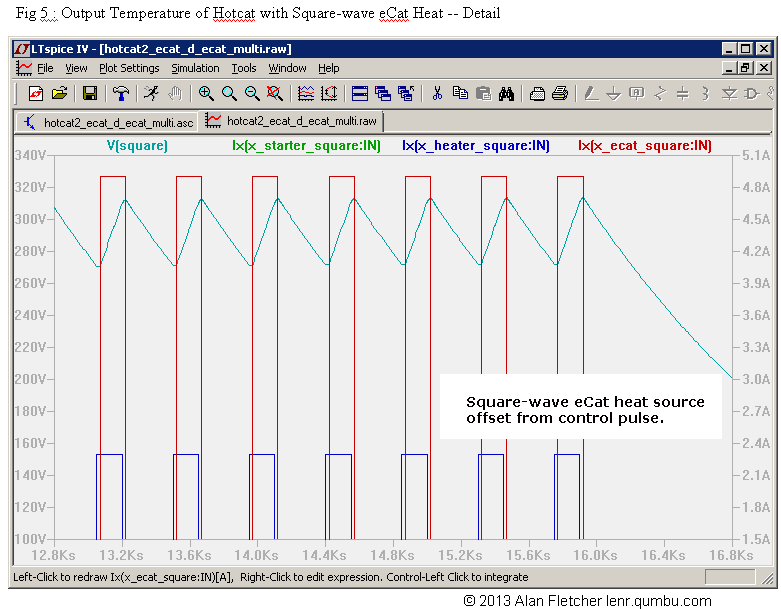 Of course the actual hotcat has a square-wave input, so we need to find some combination of input and response. This is used to explore the OUTPUT response. At the bottom right are the lumped capacitor and resistor -- which includes both the radicative and convective terms. At the top left are THREE current sources (For simulation reasons, in three stages). These ALL inject current onto the output node. 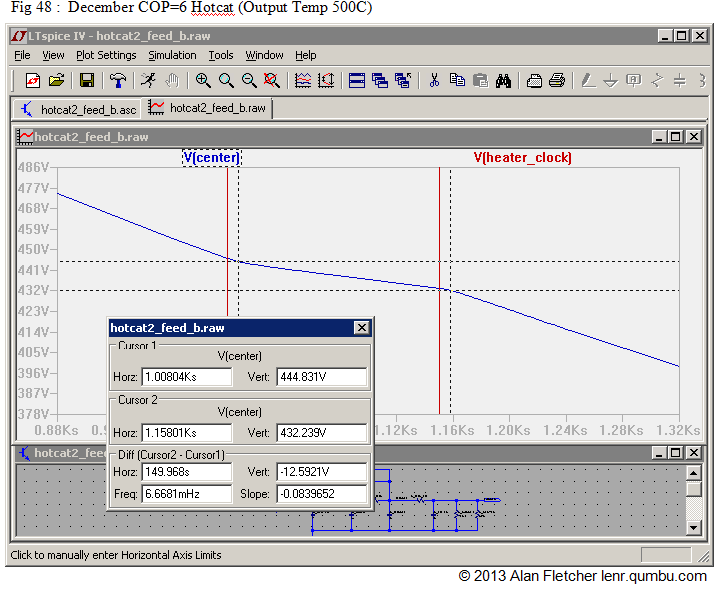 Note 1 : I am doing the simulation as if the ambient were 0 C -- freezing point -- represented by Spice's Ground node. This offset from the actual ambient of 17C (#check) is not significant for this analysis. Note 2 : Although these results are "in the ballpark", they should be regarded as QUALITATIVE only. First, consider the heat from the input resistors. One input component describes the "starter" power, and another describes the repeating heater pulses. 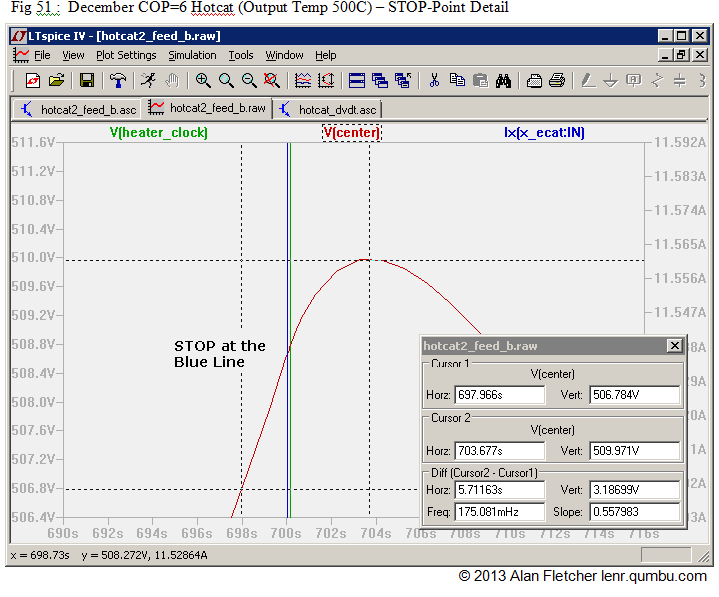 Note : the input current was determined by increasing it until the final temperature reached 300C. (Not shown), and the resulting value was used in all subsequent runs. 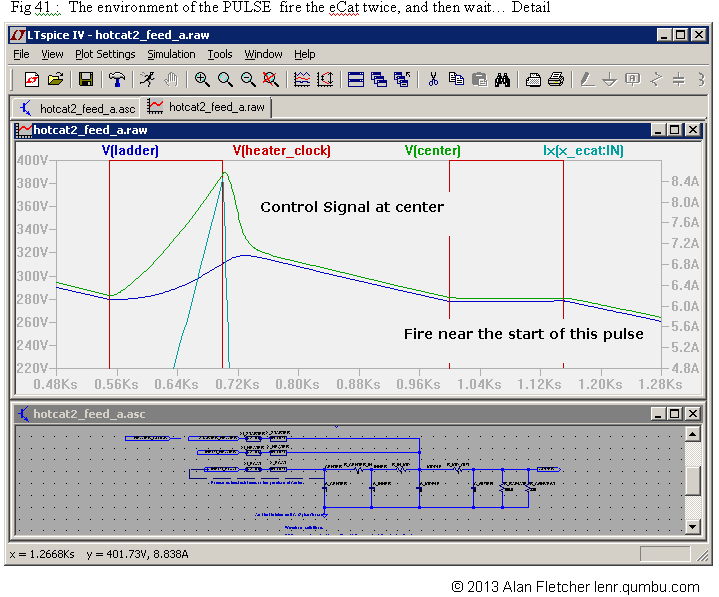 When the pulse is applied, the output rises exponetially when the pulse is ON, and falls exponentially when it is OFF. With the blank hotcat, this cannot sustain the starting temperature, so it gradually falls to about 35% (#check calculation) of the start-up value. When the hotcat is turned off, the temperature just falls exponentially to room temperature. 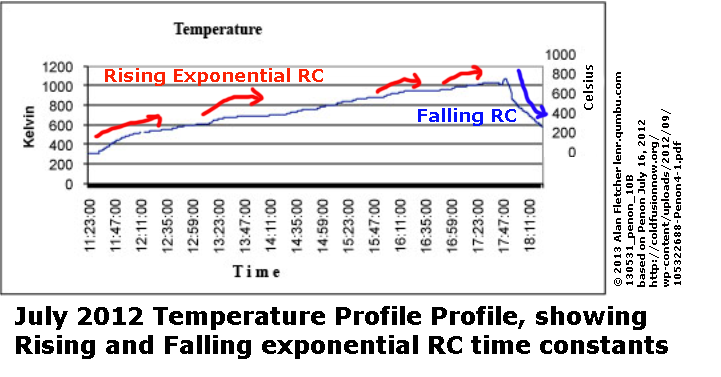 The Time constant R*C is long compared to the pulse, so it looks almost like a linear rise and fall. (In electronics, this is often used to create a triangular wave from a square-wave input ... for instance, to drive the horizontal sweep of an old-fashioned CRT TV set). 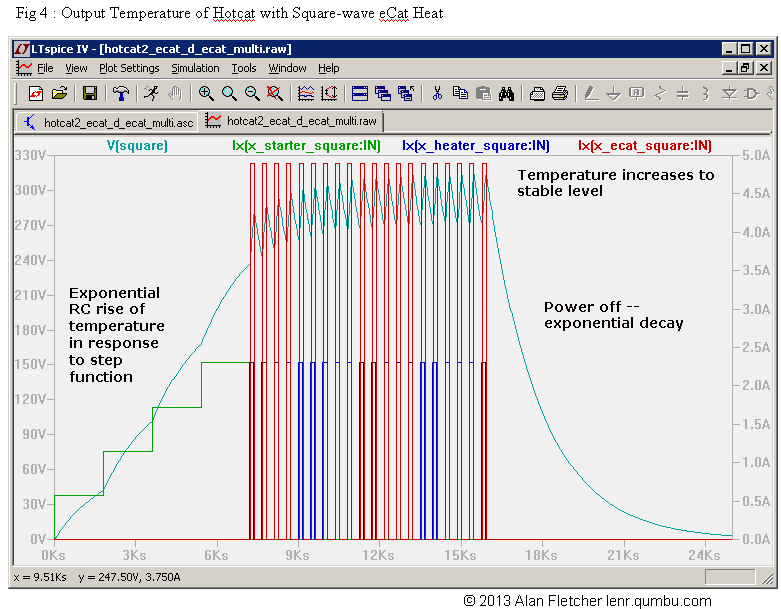 The hotcat is presumed to generate excess heat in the form of a square wave, which is offset from the input stimulus, so that the peak is offset to the right. 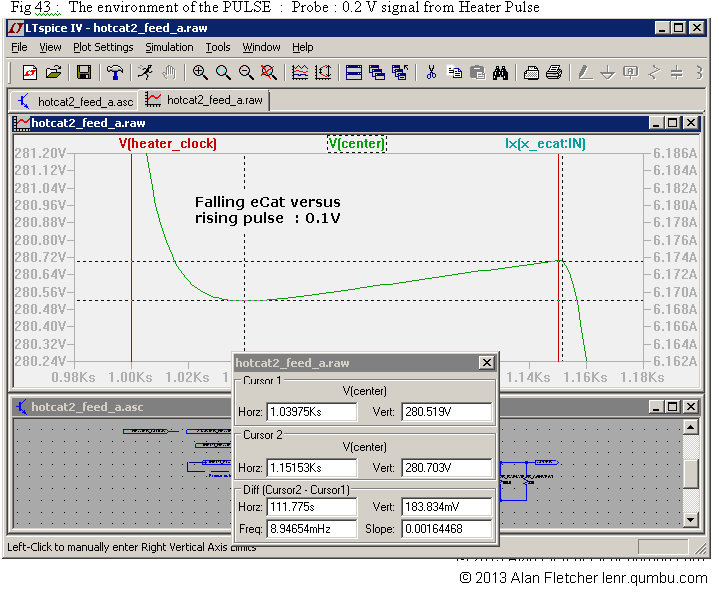 The Input peak is adjusted so that the stable peak value matches the actual peak. The Capacitance is adjusted so that the trough value matches the actual trough. This is clearly not a good match to the actual waveform .. it looks more like a triangular wave than a sin wave. 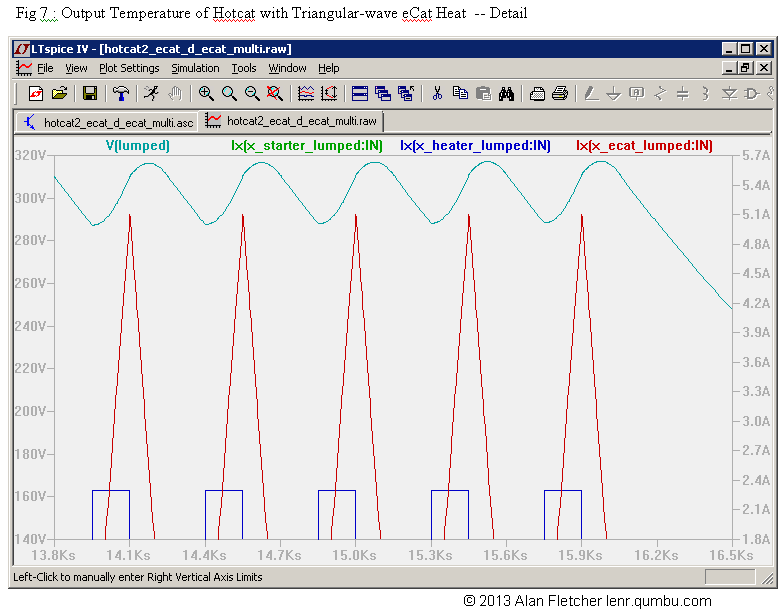 The combination of the heater's square wave and the eCat's triangular wave looks like a very good match for the required output. (I would have stopped there if I hadn't gone to a more detailed model). This starts off well ... the fall is OK, but it is not displaced enough to the right. Those are the main repeating waves which can be described with a Spice "PULSE" command. The only other one which I tried (and didn't report) is trapezoidal rise-hold-fall, but this wasn't a good match. As indicated earlier, the Triangle is best, Sawtooth next-best and square-wave worst. 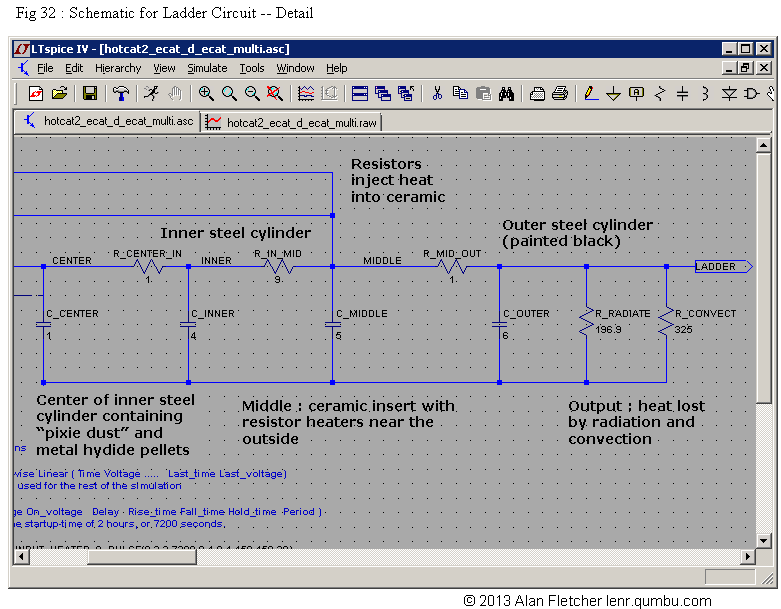 Next up : a LADDER network of RC components. That's the ladder circuit. Well, a ladder lying down. It is sometimes drawn in the vertical orientation, where the capacitors would be the horizontal steps. At the top left are the three inputs : the STARTER and PULSE heaters, and the ECAT heat. But they go to different places. At the bottom right are the two resistors, but the Capacitor now represents the specific heat of the OUTER cylinder. 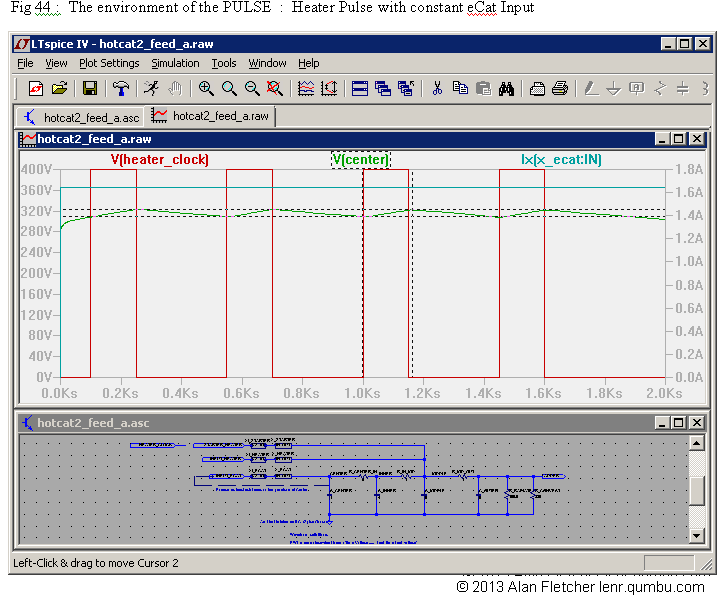 The black text at the bottom are the Spice commands describing the waveforms. This takes us to the MIDDLE. Here we have the Capacitor representing the specific heat of ALL the ceramic. This is where the STARTER and PULSED heat from the resistor is deposited. Then we have to go left through the rest of the ceramic (with a larger resistance), to the inner cylinder and its capacitor. Finally, we step into the void at the CENTER. We have to have a small capacitor and resistor even though it might in fact be empty space with little or no thermal mass. (Typo on the diagram : hydRide). The capacitance of the lumped model has been spread between the various sections in an "eyeballed" manner. The resistances are hypothetical. At the next stage these will be replaced with values from the actual components. Here we see that the eCat's anomalous heat is considered as originating in the center cavity. 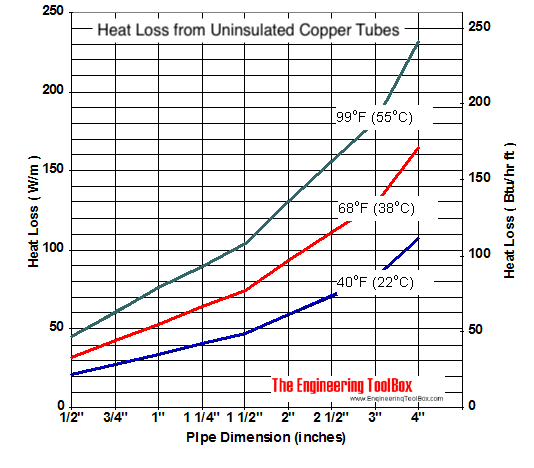 This extra heat combines with all the other heat stored in, coming into, or leaving the hotcat, producing a resultant temperature on the surface of the inner cylinder. This is transferred back into the center ... where it may affect the rate of heat production. 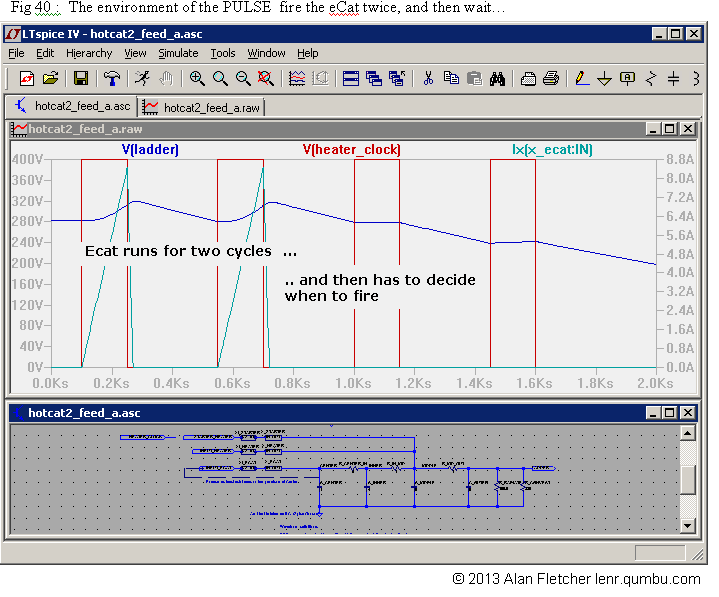 By applying the various possible waveforms I am emulating an unknown control mechanism. 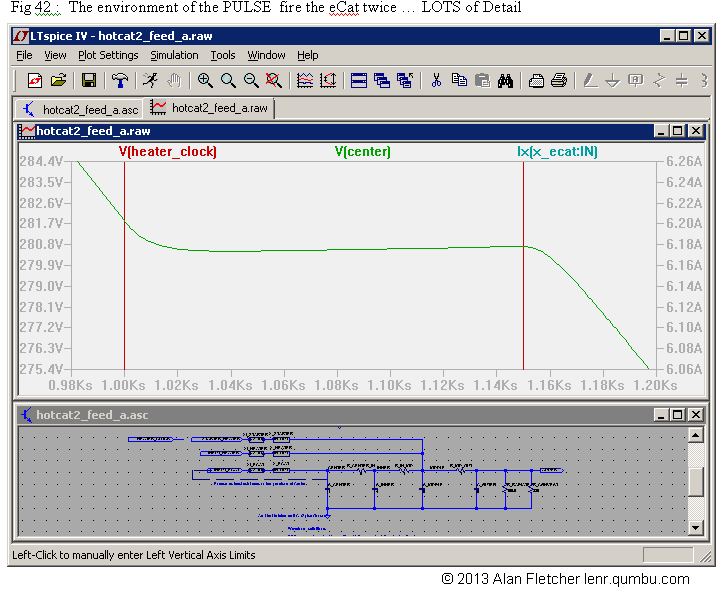 We then play the various INPUT waveforms into both the LUMPED and the LADDER model. The general shape is the same, so we will only look at the stable waveform. We will be looking at both the OUTPUT temperature, and at the CENTER temperature (which is what a control mechanism would know about). The lumped and ladder models are very close, the ladder being, as expected, a bit more rounded due to its passage through multiple RC's. 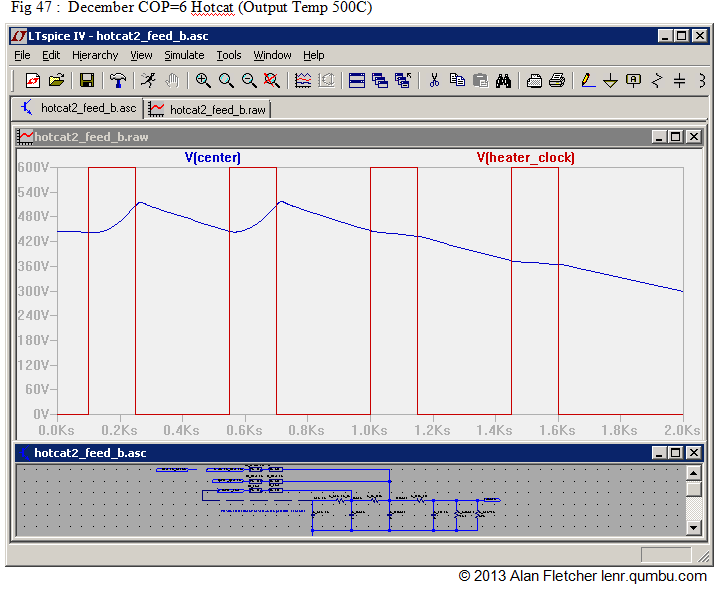 This waveform will show up as a 10 degree ripple at the center, even when the hotcat is generating heat at the 300 degree level at the output. The output is now softer than the lumped version, looking much more like the observed waveform. The center sees a sharp exponential rise and fall. It turns out that I didn't calibrate the output correctly, so the lumped and ladder models disagree about the level. The problem with this model is that the input has to turn off BEFORE the output reaches its peak. (Is this precognition?) The shape of the center temperature bears NO resemblance to the supposed triangular input. So ... is there a control mechanism that fits into this environment? Lets's look at the Temperature environment at the center of the reactor. 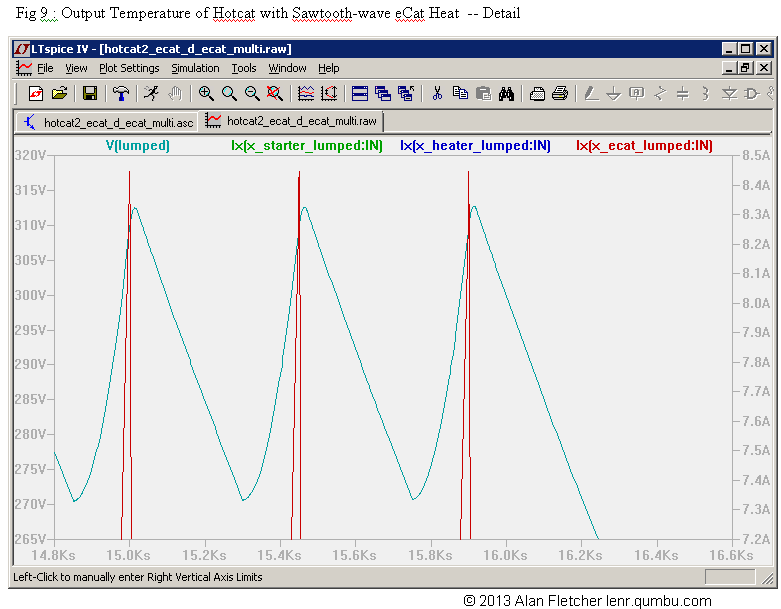 Here I initialized a hotcat, and show the result after TWO cycles of a Sawtooth waveform. 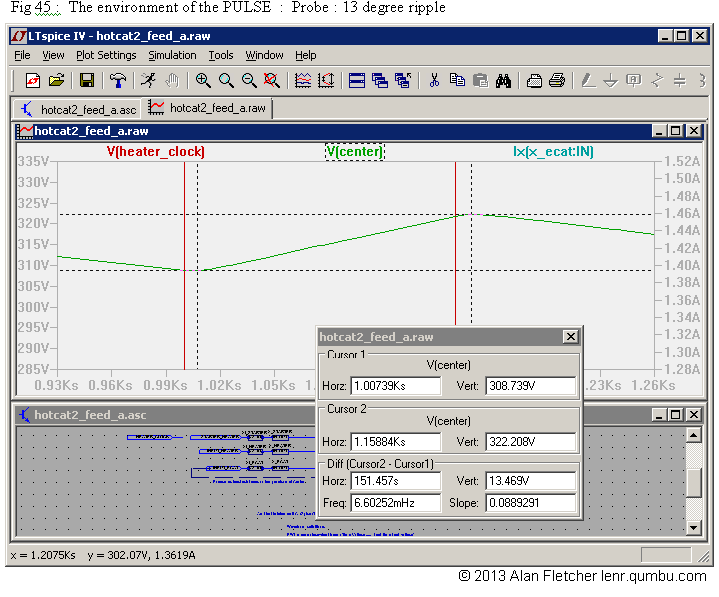 Then I OMIT my manually injected waveform, and consider what the pixie-dust would see. So we don't have a lot of information about when to START. There is NOT a clear square-wave edge to trigger the reaction. So the heater pulse IS there -- at the expected value of around 10 degrees. It's just swamped by the hotcat's output. I haven't considered the heater signal at the END of the pulse. 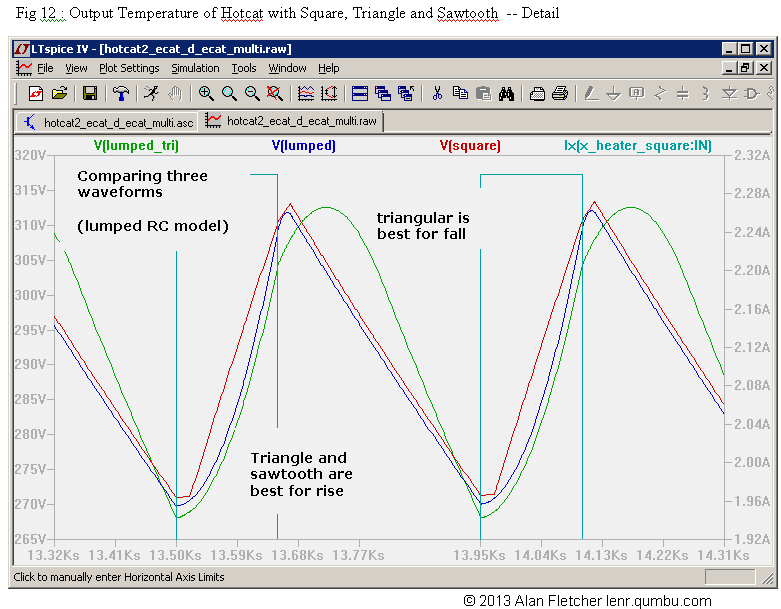 Based on the "constant heat" hotcat we know that it's a 13 degree sawtooth signal. The reaction will most likely see its own power increasing, and will then see a SMALL change in slope as the pulsed signal passes its peak. I can't think of any control mechanism that would detect this. David Roberson (on vortex) is exploring the control mechanism, also through a Spice model. At some stage we will probably combine our two models and see what happens. One more thing. I'm going to inject my personal opinion here. One of the arguments against the anomalous heat generation is that IF it occurred ON a particle of pixie-dust, it would get too hot, melting, and presumably stopping the reaction. My opinion is that the thermalization actually takes place elsewhere .. in the steel of the inner cylinder. The inner heats up, and heat is then transferred back to the center independently of its generation. I have therefore moved the eCat's heat generation from CENTER to INNER. (This also makes the modelling a little easier). Looking at the temperature of the center, we can see that it still has the 0.2 degree ripple. At this point I SHOULD calibrate the model ... rechecking all my values, plug in real physical properties like thermal resistance and specific heat, and use the actual ambient rather than 0C. 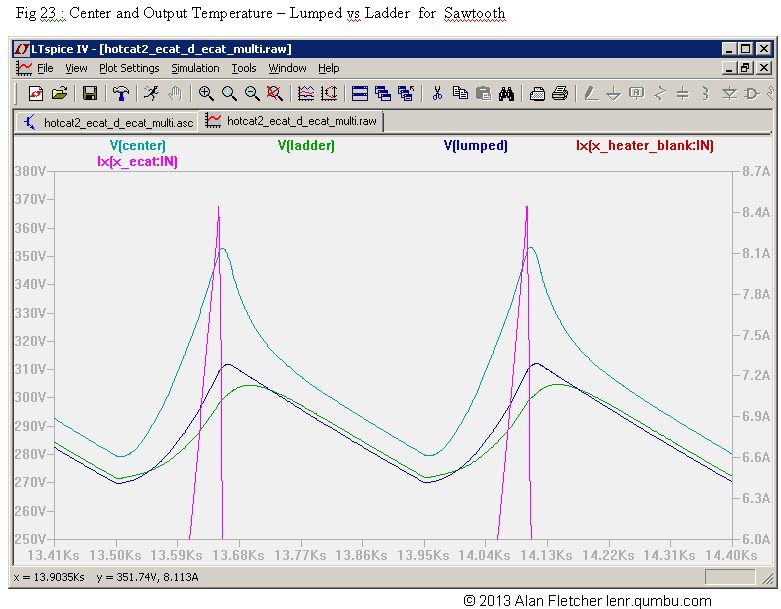 The ladder model I am using is strictly true only for heat propagation through a wall, extending sideways to infinty. We should really model at least a "slice" of the cylindrical pie. So .. the final level of modeling is a mesh model (2D should be enough), but I don't think it's going to be worth the effort. Beyond that, one needs to use a 3D finite-element model like Elmer. Permission is given to copy this document in its entirety, or to extract sections for review, provided my authorship is recognized. The images from Levi and Penon were obtained by screen captures from their documents. I have stamped them as "my copyright" for the "DERIVATIVE" component I have added (Mainly labels). I am not claiming ANY copyright for the originals : I included the links to their documents in the images. All spice simulations and other data are exclusively mine. Permission is given to use my diagrams, and to ADD to them, provided you do not DELETE any of my information, and provided you leave MY copyright notice in the derivative work. (You may wish to add YOUR mark for any additions you make. This is similar to the ancient Chinese practice of putting Chops on copies. When using these images on the WEB do not down-res the image (because all the fine-print will disappear) -- simply display the image with a smaller WIDTH, so that the user can open the full-res version. If you make a small scale image in a PRINT (or PDF) version, and the details disappear, then add the information to your caption. I wouldn't have bothered with this, but a well known Physics Organization site recently used one of my modified diagrams (which I prepared exclusively for Forbes), carefully cropped off my name, and didn't mention where they got stole it from. These are probably not relevant to the hotcat, but I'll leave them in for now.